>> Jon Kuperman: So Ben asking, I assume if I toy with the screen reader I'll only get a mediocre understanding of the UX of users with different ability levels. Are there services like usertesting.com that can give good, qualitative views into UX, real users with disabilities for our sites? I'm really not sure on that one. [00:00:17] When I was at Twitter, we were really fortunate. We had a group of people that we reached out to. But I am really not sure, as far as real-life accessibility user testing. I mean, I know it's a piece of product that a lot of the firms offer, but I'm not sure. >> Speaker 2: Or SSB BART Group do that kind of service as part of their consultation services. >> Jon Kuperman: Exactly, yeah. >> Jon Kuperman: And see if they have, yeah. >> Speaker 2: Many of them will recruit people with whatever demographics that you're looking for. That includes people with disabilities. >> Jon Kuperman: Yeah I would refer Ben, I would probably check out these two places, SSB BART Group and then Deque. And they are probably two of the front runners. If you go to an accessibility conference, they're the main sponsors a lot of the time. [00:01:17] And they do a lot of speaking too. So yeah, I would check them out and see. Yeah, like I said, I know they have contract services. But I'm not sure, as far as more of a community website, I'm not sure. >> Speaker 3: You didn't touch much, that I can recall at least, on web accessibility on mobile. [00:01:35] Is there anything that you might add about Narrator or VoiceOver? >> Jon Kuperman: Yeah, that's a really good topic. I'm never sure where to go with that. So mobile accessibility for apps is really great. 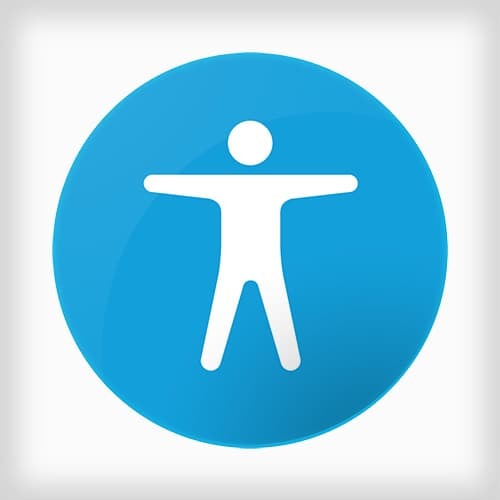 If you have an iPhone, Windows phone, Android phone, they have accessibility features built-in that are awesome, including some really cool gestures to do different things. [00:01:56] But as far as the mobile Web accessibility, not sure if I can think of all that much specifically in there. They'll have the same screen reader technology and things like that. One big one that I kind of mentioned a little bit, but thinking about stuff like characters per line, your tap targets being big and spaced enough, things like that, which can help I'm not sure if I can, off hand, think of too many other specific things. [00:02:24] But yeah, I mean mobile accessibility for native apps is its own similar field. But then as far as for the mobile Web, the ones I can just kind of think about are clean content structure, and buttons being identifiable and clickable easily. >> Speaker 3: That's where responsive design really becomes beneficial. >> Jon Kuperman: Yeah, definitely. >> Jon Kuperman: And yeah, depending on, there's a lot of really cool apps there. But also I've seen some cool stuff for parsing sites by their headers. So again, going back into using appropriate headings can have additional benefits. But yeah, I think a lot of the same Web best practices apply to mobile Web. >> Speaker 3: There was one particular problem I ran across, and it's kind of an edge case. But it was that we had an instance where we were trying to put a link inside the value, that was the label for a check box, using VoiceOver on an iPhone. Only the whole thing could get focused, so you couldn't actually dive down into the link inside of the label. [00:03:30] Because the check box was taking precedence in terms of the focus. So just to say that there are some small differences delivering the very same thing on mobile, that you don't encounter in the desktop browser. >> Jon Kuperman: Yeah, I remember we had one on Twitter, kinda similar I mean, when we started doing nested conversations. [00:03:48] Where I think it was only one of the phones, the screen reader was reading the original tweet every single time. So you'd have a tweet storm with eight tweets. And it would be like foo, foo bar, foo baz. It would just keep doing it. I was like, man, what the heck is going on? [00:04:05] But it was kind of similar, where it was overly simplified focus basically, where we really wanted focus just on the. Yeah, there's definitely some unique challenges there. Yeah? >> Speaker 2: Another from Ben. Are there any particular experts on accessibility or subtopics on accessibility that you would recommend following for more info? >> Jon Kuperman: Yeah, so as far as Twitter people go, I follow, yeah, Rob Dodson and Marcy Sutton, and then Jennison. I'll find their Twitter handles real quick. So Jennison, he's kind of the accessibility guy in the Bay Area, he's @Jennison. So he runs a lot of the meetups, and events, and things like that. [00:04:49] He works at LinkedIn, they do really great work with accessibility. And he's always announcing, I don't know. He just runs, he's got unlimited energy. He's always running cool events, so I follow him. And then as far as companies go, yeah, I think Deque and the SSB BART Group are really great. [00:05:05] And they like to tweet cool projects when they see them come. And there's, Rob Dodson has a class on Udacity, that's I believe free, on accessibility. I think that one's cool. >> Speaker 3: Karl Groves, who's the main guy at Tenon.io. >> Jon Kuperman: Karl Groves is, yeah, yeah, yeah. He's the guy that does Tenon, he has a blog that's fantastic. [00:05:27] He does a bunch of public speaking. There's some really cool events. I only really know the West Coast ones, cuz that's where I live right now. But I'm sure there's really cool events over here. And the community's pretty small, so you get to kinda meet and hang out with everybody. >> Speaker 4: I think there's a online Accessibility Summit. >> Jon Kuperman: Yeah! So yeah, it's part of the Global Accessibility Awareness Day. I think it's yearly. I think it's every year, I'm not sure. >> Speaker 4: Well, there is that one. But then there's also I think an online only conference called the Accessibility Summit. [00:06:04] I think, let me see. >> Jon Kuperman: Yeah, I think that happened a month ago or something like that. So catch the next one [LAUGH] coming around, yeah. >> Speaker 4: Yeah, I guess there's something else called the Accessibility Summit, so. >> Speaker 4: There's, I don't know. >> Jon Kuperman: Yeah, I mean, so if you can get to an event, that's a really great way. [00:06:24] Most people go to most of the events, and it's a cool place to network. And people are always building really cool stuff. A lot of people from Google will be there. And that's a great place to voice, hey, I'm having this issue with your accessibility dev tools. People making accessible video players and accessibility, a lot of really cool stuff gets talked about at those events. [00:06:46] So I like going to those, if you ever get a chance to go to one. Also the guy that, yeah, as Jeremy's pointing out. So Ryan Florence, who was one of the people that started the react-a11y thing. I think it was him, it might have been somebody else now that I think about it. [00:07:03] Somebody started a slack for accessibility, and it uses that cool slack in thing. So you can get your, yeah, that's right, Ryan Florence. So you can go to, let's see, a11y.herokuapp. Sorry, web-a11y.herokuapp.com. Put in your e-mail, you get an invite, you can join the slack. That's got a ton of people in it, which is great too. [00:07:26] I'm trying to think of other resources. I tweet about stuff, whenever I see cool stuff that comes out. But yeah, I think those are. That's a lot of cool follows, a lot of people to follow to get started with that stuff.